The Chesapeake Expressway is the name of the 16.5-mile-long limited access highway between the I-64/I-464 interchange and the North Carolina border, and it was completed in May 2001. The highway is fully within the City of Chesapeake, Virginia, and its route number is Virginia Route 168.  The highway is four lanes wide (two lanes each way), with a graded median divider 30 feet or more wide, and it is built to full freeway standards from I-64 to about 2 miles north of the North Carolina border, and the southernmost 2 miles is an at-grade expressway with several intersections, with two of them signalized. The highway continues in North Carolina as N.C. Route 168, as a four-lane non-access-controlled highway, with a continuous left turn middle lane, for 17 miles from the Virginia border to Barco, N.C., where it junctions and ends at US-158, which is four lanes divided all the way to the Outer Banks of North Carolina. This will provide major traffic benefits for the City of Chesapeake and the whole corridor from Norfolk to the Outer Banks, which sees heavy summer traffic to-and-from the North Carolina beach resorts. For the first time, a continuous, modern four-lane divided highway exists between the Norfolk/Hampton Roads area and northeastern North Carolina; previously, the two regions were accessible only by travel on long sections of non-access-controlled two-lane highways. The Chesapeake Expressway was built parallel to VA-168 Battlefield Boulevard, and the expressway crosses it in three places. With the completion of the expressway in May 2001, Battlefield Boulevard was redesignated as Business VA-168. Above, southbound on the Chesapeake Expressway, approaching Indian Creek Road overpass and the toll plaza which is just beyond the overpass. Photo by Scott Kozel. The last 10.2 miles of the VA-168 Chesapeake Expressway was placed under construction in March 1999, and it was opened to traffic on May 23, 2001, most of which is tolled, completing the highway from I-64 to the N.C. border (although the southernmost 2 miles was partially completed in March 2001), also completing a continuous four-lane highway from I-64 in Chesapeake, Virginia to the Outer Banks of North Carolina. This is an important milestone in providing modern four-lane highway service between these two places. Previously, VA-168 followed the old 2-lane Battlefield Boulevard, which has a lot of homes and businesses along it. By linking to the Interstate highway system in Chesapeake, the Chesapeake Expressway thereby links to all the Interstate system in the Norfolk/Hampton Roads area and the rest of the state of Virginia. City of Chesapeake officials expect the Chesapeake Expressway to change the face of Chesapeake. In the short term, the four-lane highway through the city's agricultural south improves traffic both to North Carolina and on local roads, and eases the summertime weekend traffic. In the future, officials hope that the bypass will fill the city's tax revenue coffers by attracting commercial development to the corridor. At $125 million for design, right-of-way and construction, the 10.2 mile section of the Chesapeake Expressway opened in May 2001 is the most expensive project ever undertaken by the City of Chesapeake. At 10.2 miles, it is the longest road ever built by the city. To complete the project, the city built or modified 10 bridges, acquired 184 pieces of property and removed 18 buildings. The roadway of the highway is paved with hot-mix asphalt (bituminous concrete) on top of an aggregate base course. Battlefield Boulevard was designed to accommodate 8,000 vehicles per day but as many as 30,000 vehicles drove on it during summer weekends just prior to the opening of the Chesapeake Expressway. The 55 mph Chesapeake Expressway can easily handle 50,000 vehicles per day or more, and it shaves 20 minutes off the travel time compared to before the expressway was opened. Mainline VA-168 Chesapeake Expressway automobile toll is $2.00, with a $0.50 toll for regular users, and the mainline toll plaza is near Indian Creek Road. The existing Battlefield Boulevard is VA-168 Business, and is toll-free. The prime contractors were as follows. The North Contract, from the Great Bridge Bypass to the Toll Plaza, the contractor was The Driggs Corporation. The Toll Facility Contract, between Indian Creek Road and St. Brides Road, the contractor was Mid Eastern Builders. The South Contract, from the Toll Plaza to the NC Line, the contractor was Suburban Grading & Utility Inc.
VA-168 Chesapeake Expressway official website. Includes a map showing the highway. Chesapeake Expressway Photos - March 2001 - my article with five photos of construction of the highway. Chesapeake Expressway Photos - May 2001 - my article with nine photos of the completed highway. 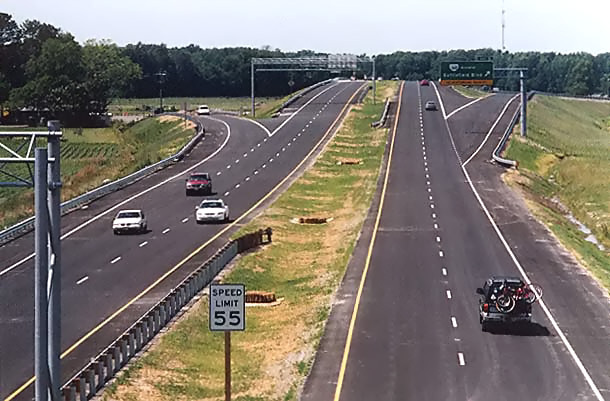 The 16.5-mile-long VA-168 Chesapeake Expressway is comprised of the 10.2-mile-long newly-opened section, plus the earlier-built toll-free Oak Grove Connector and the toll-free Great Bridge Bypass, and it is one seamless superhighway. The VA-168 Oak Grove Connector is essentially a southerly extension of Interstate 464, and it is a 4-lane freeway that connects I-464 to the VA-168 Great Bridge Bypass. The 10.2-mile-long Chesapeake Expressway opened May 2001 is an extension of the south end of the 3.8-mile-long Great Bridge Bypass, to the North Carolina border. The 4-lane Great Bridge Bypass was completed about 1980 and it includes a 2,750-foot-long high-level bridge with 65 feet of vertical navigational clearance over the Intracoastal Waterway / Chesapeake and Albemarle Canal; the canal is only about 100 feet wide and most of the bridge is high-level approaches over land. On July 22, 1999, the 2.5-mile-long Oak Grove Connector was completed, and this basically extends the I-464 freeway from the I-64/I-464 interchange to the north end of the VA-168 Great Bridge Bypass, forming a continuous I-464/VA-168 freeway. The Oak Grove Connector bypasses Battlefield Boulevard (now VA-168 Business). 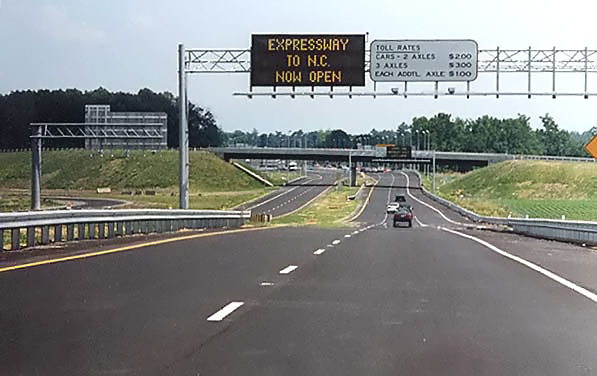 With the completion of the VA-168 Chesapeake Expressway, a continuous north-south expressway is in place from downtown Norfolk to the North Carolina border. Someone reading this may wonder if the VA-168 Chesapeake Expressway will be eventually designated as I-464, but I have not heard of any such plans; indeed, in 2001, VDOT and the city just went to a lot of effort to sign the new highway as VA-168, and to change the VA-168 Battlefield Boulevard's route number to Business VA-168. Since North Carolina uses Route 168 for the same arterial highway, it probably makes more sense to number it the way that Virginia just did. Mayor William E. Ward and other city officials will participate in a ribbon cutting and dedication ceremony on Thursday, July 22, at 11:00 a.m., in observance of the completion of the Oak Grove Connector project. Keynote speaker for the occasion will be Chesapeake native son Senator J. Randy Forbes, member of the Virginia General Assembly. The ceremony will take place on the new Route 168 southbound ramp near the Dominion Boulevard/I-464 interchange. The Oak Grove Connector, part of the Chesapeake Expressway highway system, has been in the City's master street plan and regional long-range transportation plan since the 1960s. Construction began on the Oak Grove Connector project in August 1997. This 2.5 mile, four-lane divided limited access roadway provides a new interchange at Dominion Boulevard and is one segment of the 16-mile Chesapeake Expressway. Northbound lanes were opened on May 20, 1999. Once the toll road segment (Route 168) is completed, motorists will have a continuous stretch of four-lane controlled access highway from I-64 to the North Carolina state line. The Oak Grove Connector project was designed and constructed in less than two years. The connector will allow vehicles to bypass seven traffic signals and traffic congestion along North Battlefield Boulevard. With the completion of the Oak Grove Connector, City officials expect a twenty to thirty percent reduction in traffic along North Battlefield Boulevard. The Virginia General Assembly approved legislation for State financing of the Oak Grove Connector in 1993. The financing is unique. The City is dedicating its share of the State recordation taxes distributed to localities to pay for approximately half of the annual debt service. The other half of the debt service will come from local general revenues and is being provided by the City of Chesapeake through a contract with the State. Sale of these State bonds resulted in the lowest true interest cost in the history of the Virginia Department of Transportation. The total project cost, including design, permits and right-of-way acquisitions, is $38 million. The Oak Grove Connector was designed by local companies including the engineering firm, Kimley-Horn & Associates. Road construction will be completed by the contracting firm of Higgerson-Buchanan, Inc. Above, I'm standing on the Indian Creek Road overpass, looking north onto the Chesapeake Expressway. The off-ramp sign says "168 BUSINESS - Battlefield Blvd". Photo by Scott Kozel. Above, the 2,750-foot-long high-level bridge with 65 feet of vertical navigational clearance over the Intracoastal Waterway / Chesapeake and Albemarle Canal. The approach spans pass over adjacent wetlands. Looking north. This is part of the Great Bridge Bypass that was opened about 1980. Aerial photo by Virginia Department of Transportation. For a Chesapeake Expressway crossing inventory, moving from the north end to the south end: The Oak Grove Connector has a semi-directional interchange with US-17 (old VA-104) just south of I-64, and has a direct expressway movement with I-464/US-17. The Oak Grove Connector becomes the Great Bridge Bypass (they are one seamless expressway) north of Great Bridge where the expressway passes over Battlefield Boulevard and includes a full cloverleaf interchange between the expressway and Battlefield Boulevard. The expressway passes over VA-190 Kempsville Road about 1/4 mile east of Battlefield Boulevard, with no connection. The expressway includes a 2,750-foot-long high-level bridge with 65 feet of vertical navigational clearance over the Intracoastal Waterway / Chesapeake and Albemarle Canal. VA-165 Mount Pleasant Road has a full diamond interchange with one loop. A full diamond interchange with one loop was built at Hanbury Road on the Great Bridge Bypass, about 1/2 mile from the southern end of that bypass, because when the Chesapeake Expressway was extended south from there, the former at-grade intersection at the former southern terminus of the bypass was closed, and the Hanbury Road interchange provides the replacement of that local access point, and Battlefield Boulevard was relocated to pass over the Chesapeake Expressway on an overpass. Peaceful Road passes over the expressway on an overpass about 1/2 mile south of there, with no connections. About 2 1/2 miles south of the Hanbury Road interchange is the Hillcrest Parkway interchange; this is a full diamond interchange with one loop, that was built with a new local thoroughfare (Hillcrest Parkway) that provides access to Battlefield Boulevard by an intersection about 1/2 mile to the east. About 2 miles further south, Benefit Road passes over the expressway on an overpass, with no connections. The Chesapeake Expressway crosses over Battlefield Boulevard about 1/4 mile north of Indian Creek Road, and there is a partial interchange between the two that handles the two southerly (to and from the south) movements. The toll plaza is about 1/4 mile south of Indian Creek Road. About 1/2 mile north of the Northwest River is the at-grade signalized intersection with Gallbush Road, and this is the southern limit of the full freeway design. Business VA-168 ends here also. The highway passes over the Northwest River on twin bridges about 550 feet long. There is another at-grade signalized intersection with Battlefield Boulevard / Ballahack Road just south of the river. The relocated expressway continues to the east of the old highway and merges into the existing highway about 1/4 mile north of the North Carolina border. About one mile of Battlefield Boulevard still exists to the west of the new highway, but it does not have a route number, and it dead ends in a cul-de-sac about 1/4 mile north of the N.C. border. I rode NC-168 in North Carolina in May 2000, and it has all been 4-laned since I last drove through there in December 1995. In 2001, the director of economic development for Currituck County, N.C., told me that it was completed in 1997. Interestingly, he also told me that about 50% of the economic activity in his county (which is just south of the City of Chesapeake, Va.), comes from people whose primary residence is north of the state border. Actually, Currituck County has a great deal of prime waterfront land, about 22 miles on the Atlantic Ocean, about 50 miles on the eastern shore of Currituck Sound, about 50 miles on the western shore of Currituck Sound, about 25 miles on the eastern shore of the North River, and about 10 miles around Mackay Island which is in Currituck Sound. Check it out on a map, even a Rand McNally atlas will show enough detail to see what I'm referring to. Granted that some of the waterfront land is undevelopable due to being wetlands, but the vast majority is developable; making the county a fine place for business and recreation. The director expressed appreciation of Virginia's upcoming completion of the Chesapeake Expressway. The 10.2-mile-long project opened in May 2001 was administered by the City of Chesapeake. Riding in a silver convertible with the top down, Chesapeake Mayor William E. Ward smiled broadly, the first person to ceremonially pass through the Route 168 Bypass toll plaza Wednesday. The first paying customers rolled past on the long-awaited road a few hours later at 5:30 p.m. "No longer will Chesapeake be the bottleneck," Ward told hundreds of people who attended opening ceremonies staged on the road, in the shadow of the tollbooths. 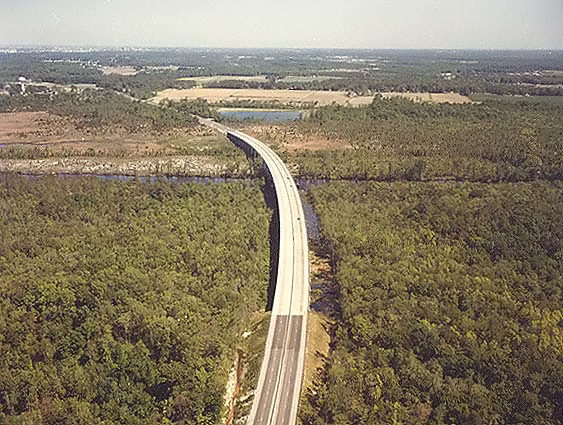 The 10-mile bypass, the largest construction project in city history, is the final link of expressway that now connects interstates 64 and 464 to the North Carolina border. Dozens of city and state officials were on hand to celebrate the achievement that some have awaited for decades, but the biggest cheers were saved for D. Ray Stout, the city's project manager for the expressway. "It's sort of like having a baby," said a choked-up Stout, who has worked on the road since its infancy. The audience responded with a standing ovation. Stout, driving his white pickup, was the first person to plunk down $2 when the road officially opened. The Chesapeake Expressway is expected to speed tourists on their way to the Outer Banks without the hours-long delays that sometimes plagued weekend travel on the two-lane 168 business route. During the opening ceremony, a small memorial was dedicated to 4th District U.S. Rep. Norman Sisisky, who died in March. Ward said Sisisky was instrumental in getting federal dollars for the project. 3) and, The Route 168 Project, a ten-mile, four-lane highway extending from the southern terminus of the Great Bridge Bypass, connecting to the interchange at Hanbury Road and ending at the Virginia/North Carolina State line. The 10.2 mile long Route 168 South Project is located entirely in the City of Chesapeake and will generally run parallel to the existing Route 168, Battlefield Boulevard. A substantial portion of the project (6.4 miles) will be tolled and have a single mainline toll plaza located between Indian Creek Road and St. Brides Road. From the Great Bridge Bypass (Route 168) the Expressway will cross over Battlefield Boulevard south of the Hanbury Road exit and proceed to the last free exit going south at Hillcrest Parkway. Motorists will then continue nonstop to the Toll Plaza at Saint Brides, then travel on the toll road to Gallbush Road. From Gallbush Road to the North Carolina State line, the project will be a controlled access, non-tolled facility with limited ingress and egress limited to specific locations. When completed, the Chesapeake Expressway will provide a direct access route from Interstate 64/464 to the North Carolina Route 168. The Chesapeake Expressway is designed to serve as the primary link between northeastern North Carolina, whose beaches and historical sites are popular tourist destinations, and the heavily populated Hampton Roads Metropolitan area. The project ties into the North Carolina five-lane road section recently completed by the North Carolina Department of Transportation providing a continuous high-speed connection from I-64 to the Outer Banks. Toll collection - A state-of-the-art electronic toll collection system, compatible with those on other state roads, will be utilized to minimize inconvenience to users and will include one high-speed dedicated electronic toll collection lane in each direction. How long will the tolls be in effect? - Tolls will be in effect until the Toll Revenue Bonds used to finance the project have been repaid. The toll study commissioned by the City projects that the bonds should be repaid by 2032, but it may be sooner depending on the amount of revenue generated by the tolls. One of Richmond's favorite vacation spots, the Outer Banks of North Carolina, is about to get closer. The physical distance will stay the same, of course. But when the new Chesapeake Expressway opens Wednesday, the time it takes to drive from Interstate 64 south to the North Carolina line will shrink by 20 minutes when traffic is light and much more on the high-season beach weekends that have produced nerve-jangling traffic jams for decades. "Now it's going to be one continuous stretch of highway going from the Outer Banks north," said Harry C. Kenyon, spokesman for the Chesapeake Public Works Department. "It's going to be increased speed, increased safety." Under construction for two years, the $116 million expressway will complete a 16-mile stretch of four-lane, divided highway running from Interstates 64 and 464 all the way to the North Carolina line. There the new road, designated state Route 168, connects with North Carolina's Route 168, which is a continuous five-lane highway to the Outer Banks. Besides convenience for local residents, tourists and commuters, the new road will also increase safety during evacuations of Outer Banks tourists and residents when hurricanes threaten. The road, which opens Wednesday afternoon after a ceremony at the toll plaza, is also expected to help speed evacuation times for Virginia residents who live near the expressway. Hui-Shan Walker, Chesapeake's deputy coordinator of emergency management, said officials believe it won't be necessary to reverse the southbound lanes of the expressway to facilitate evacuations, but they do plan to suspend toll collection when an evacuation has been ordered. "Knowing that this road is open in time for the 2001 hurricane season really helps us in our emergency planning," said Sandy Sanderson, Dare County, N.C.'s, director of emergency operations. "Like Virginia citizens, we, too, have been waiting a long time for this road." Chesapeake City Manager John L. Pazour said building the expressway was one of the biggest challenges the city has ever faced. The problems on the project -- which the city began planning in the late 1960s -- began even before ground was broken. In the 1970s officials had trouble finding the money to build the road. Once the federal, state and city money was in place, environmental regulations slowed the process of acquiring permits. Then, in 1998, the city planned to build the road under a public- private partnership, rather than having an open bid, in which contractors compete for the work. Local contractors threatened to sue the city if the project wasn't opened up for competitive bid. Eventually, the City Council voted to scrap the public-private partnership plan. Once work began on the project during the summer of 1999, contractors were faced with torrential downpours brought on by hurricanes Dennis and Floyd. Finally, the contractor building the north section of the road -- Baltimore-based Driggs Corp. -- filed for bankruptcy in January. Payments to Driggs' subcontractors fell behind and the company's bonding agent -- Travelers Indemnity Co. -- had to step in to make the payments. Ray Stout, the city's project manager for the expressway, said dry weather over the past few weeks has enabled Driggs to finish almost all of its work. The other two contractors -- Norfolk-based Suburban Grading & Utility and Chesapeake-based Mid Eastern Builders -- finished last month. Grand opening ceremonies will be held Wednesday morning. Scheduled speakers include Virginia Attorney General Mark L. Earley, Virginia Secretary of Transportation Shirley J. Ybarra, state Sen. Randy Forbes of Chesapeake and J. Owen Etheridge, chairman of the Board of Commissioners of Currituck County, N.C. The expressway then will open to the public at 6 p.m., pending a final inspection by the Chesapeake Public Works Department. Landscaping along the edges will continue for several weeks but will not affect traffic. Its a beautiful roadway, a nice blend between brand new, modern roadway and the traditional sense of rural Chesapeake that people have come to appreciate, said Harry Kenyon, spokesman for the Public Works Department. With last week's opening of the new Chesapeake Expressway, not only did Lee Richards' driving time to the Outer Banks become shorter, but so did some of his family vacations. Not that the 43-year-old lieutenant in the Henrico County Fire Department necessarily minds, though. "The past few years, [the traffic] has gotten so bad that when we can check into a cottage on Saturday, we've come down on Thursday or Friday and paid the extra money to stay at a hotel," said Richards, who has vacationed in the Outer Banks practically every summer since he was 12. "Now that this expressway is open, it should alleviate that." Richards said the expressway - a 16-mile, four-lane highway that provides a direct link from Interstates 64/464 to the Virginia/North Carolina border - chopped at least 20 minutes off his normal time. The new highway bypasses the time-consuming Battlefield Boulevard, a two-lane road in Chesapeake that has long been the primary route for tourists to the Outer Banks. The 16.5-mile-long VA-168 Chesapeake Expressway can trace its official history back to 1972, when the Virginia Department of Highways (VDOT's predecessor agency) conducted location studies and held location public hearings on the corridor. The location of the alignments of the Great Bridge Bypass and the Oak Grove Connector, were officially approved then. From the south end of the Great Bridge Bypass to the North Carolina border, the approved concept was for dualization of the existing VA-168 by building a parallel roadway, resulting in a four-lane divided non-controlled access highway; and a couple sections would have been realigned, to remove a curve near Indian Creek Road and to avoid a developed area south of the Northwest River. Due to funding limitations, the only part of the 1972 study to be built soon afterward was the Great Bridge Bypass, completed by VDOT in 1980. The Oak Grove Connector wasn't completed until 1999, and was built by the City of Chesapeake. A new set of location studies and location public hearings was conducted in 1988 and 1989, and this resulted in the approved alignment which resulted in today's new location expressway south of the south end of the Great Bridge Bypass. The 1989 study brochure had a target date of 1991 for construction, and as we can see, construction didn't start until March 1999. Battlefield Boulevard South (Route 168) is currently a two-lane road with significant areas of residential and commercial development along its primarily agricultural length. Current average daily traffic volumes range from 12,500 at Ballahack Road to 15,500 between Ballentine and Benefit Roads. Anticipated growth along the corridor is projected to increase average daily traffic to 31,000 - 32,000 vehicles per day by the year 2010. The route is heavily congested during peak travel periods, which causes significant delays for motorists and inconvenience for those living along the facility and results in traffic and safety problems. Current traffic congestion results from increased residential and commercial growth along the corridor and from increased recreational demand to and from the Outer Banks. The need for improvements to Battlefield Boulevard South (Route 168) has been recognized since the early 1970s. Initial location Public Hearings for improvements along the corridor were held as part of the Great Bridge Bypass project in December 1972. The proposed alignment presented at that time provided for additional parallel lanes to be added adjacent to the existing alignment with the exception of realigned sections between Indian Creek Road and Hickory Road and south of the Northwest River Bridge. Due to the unavailability of funds and projects of higher priority within the city of Chesapeake at the time, the Great Bridge Bypass was the only portion of the program presented at the 1972 Location Hearing that advanced to construction. Battlefield Boulevard South (Route 168) continued as an important link in the regional transportation plan developed in the early 1980s by the Southeastern Virginia Planning District Commission (SVPDC). In their Southeast Virginia Region 2000 Highway Plan, the SVPDC recognized Route 168 as the principal north/south link to North Carolina and recommended corridor improvements to accommodate present and future corridor demands. Considering current and projected traffic volumes, as well as the anticipated growth within the corridor, the improvements to Battlefield Boulevard South (Route 168) now under design have become a high priority within the city of Chesapeake. In July, 1987, the Virginia Department of Transportation (VDOT) retained the engineering firm of Parsons Brinckerhoff Quade & Douglas, Inc., to prepare location, right of way, and roadway plans for improvements to Battlefield Boulevard South (Route 168). Alternative alignment studies for the improvements to Route 168 were initiated by VDOT in cooperation with the city of Chesapeake. Following these studies, Citizen Information Meetings were held on October 14 and 15, 1987, at the Hickory Elementary School to enable citizens to comment on the location alternatives and other considerations. Additional Citizen Information Meetings were held on January 20 and 21, 1988, at the Southeastern Elementary School in conjunction with the Location Public Hearing, which was held on January 21, 1988, at the same location. At the hearing, nine location alternatives were considered, a preferred alignment for the proposed improvement was presented, and citizen comments were received. e. Provided service roads to maintain access to adjacent properties. Subsequent to the public hearing, the preferred corridor and alignment for improvements to Battlefield Boulevard South (Route 168) were endorsed by the Chesapeake City Council and adopted by the Commonwealth Transportation Board in April of 1988. The improvement to Battlefield Boulevard South (Route 168) will be constructed as a limited access, four-lane, divided major arterial highway. The typical roadway section will have two 12-foot wide traffic lanes in each direction separated by a 42-foot wide grass median. Paved shoulders will be provided on both sides of the travel ways, 10 feet wide on the right and 3 feet wide on the left. Access to the facility will be provided by grade separated interchanges at Hanbury Road, Sign Pine Road, and at existing Battlefield Boulevard South just north of Indian Creek Road. At-grade intersections will be provided at Gallbush Road, Ballahack Road, and at realigned existing Route 168 north of Gallbush Road. Grade separations (bridges) are planned at Peaceful Road, Benefit Road, Indian Creek Road, and Saint Brides Road. Although not permitting access, these grade separations will allow continued through movement across the new facility. In order to protect the public's investment in the project, it is proposed that right of way be obtained to provide limited access control throughout the length of this project. Access would only be allowed where indicated on the maps. No private access to this facility would be permitted. In 1988 dollars, the estimated cost for construction of the proposed facility, including construction, right of way, and utility adjustment, is approximately $55,900,000. Traffic volumes have exceeded projections on the Route 168 Chesapeake Expressway, and while the mainline 4 lanes handles the traffic well, the mainline toll plaza experienced congestion during peak summer weekend periods, and temporary additional toll booths were set up to solve the congestion, and the toll plaza will need to be expanded with more lanes in order to handle the traffic without congestion. When the road debuted in May, city officials figured it would be able to handle summer tourist traffic for years. It turned out that the $8 million toll plaza was overwhelmed by June, with cars lined up for two miles. Now the city has gotten the green light from the Virginia Department of Transportation to spend money from a $9 million contingency fund to fix the problem by expanding the toll plaza, said assistant city engineer Jay Tate. Tate expects the project will cost less than $4.5 million. The new permanent booths won't be ready until May 2003 at the earliest, so the temporary booths will be in operation next year from Memorial Day to Labor Day. On some Saturdays during the summer, more than 32,000 cars used the road, nearly three times estimates. Temporary tollbooths were brought in to handle the crush of traffic, and the backups went away. While the toll plaza can easily handle weekday commuter traffic -- although those numbers are also higher than projected -- a permanent fix is needed to accommodate summer tourists driving to and from the Outer Banks in North Carolina. A preliminary study shows two or three booths need to be added in each direction, Tate said. Right-of-way and wetland issues mean the new booths likely will be built down the road from the existing booths. One quick way to raise the toll plaza's capacity is to increase the amount of cars using Smart Tag, an electronic toll collection system that offers discounts for daily users. If VDOT joins the E-ZPass system, another electronic collection system used in much of the Northeast, it would triple the amount of cars that could use the high-speed lanes during peak hours. 'That would basically free up a tollbooth,' Tate said". "VDOT is negotiating to join E-ZPass, he said". The article goes on to say that several factors led to the underestimated traffic projections. More local traffic than expected used the toll road instead of Battlefield Boulevard, and more drivers chose the toll road over U.S. 17 than expected. Despite a bumpy first year, city officials -- at a one-year anniversary event Thursday -- said the expressway is a success. In its first year, it collected $5.6 million in tolls, and 3.3 million vehicles passed through the toll plaza. The expressway connects interstates 464 and 64 with the North Carolina line and is a popular route to North Carolina's Outer Banks. It experienced long traffic jams its first weekend, and officials had to scramble to install temporary tollbooths to ease the congestion. No long backups occurred after that, said the expressway's administrator, Stephan Andriuk. The city plans to spend $6 million to build six additional tollbooths. The expansion is being paid for out of a contingency fund set up for the $116 million project. While the expressway has made the trip to and from North Carolina much faster for tourists and commuters, officials say giving Battlefield Boulevard [Business VA-168] back to local traffic is the real boon. As the article says, six additional tollbooths will be built in order to accommodate the traffic volumes. Two years ago, Charles Walker's trips to the Outer Banks got a whole lot easier. That's when the Chesapeake Expressway -- a four-lane highway connecting Interstates 64 and 464 with the North Carolina line -- opened. For the holiday weekend -- and all summer long -- travelers can expect an easy road as well, city officials said. 'The stretch of pavement vastly improved the trip to and from North Carolina for commuters and vacationers. It also has provided relief for residents living along Battlefield Boulevard, who used to feel trapped in their driveways when summer traffic gridlocked the two-lane road. While city officials and drivers call the expressway a success, it has had problems. Faulty traffic projections led to the road's toll plaza being overwhelmed with traffic just days after it opened. Temporary toll booths -- two in each direction -- had to be installed to help handle the volume. The city plans to add six toll booth lanes -- three in each direction -- at a cost of $6 million, said Terry W. Herbert, the new administrator for the expressway. Increased use of the Smart Tag program has been a major factor in avoiding traffic jams, Herbert said. In the expressway's first year, there were 906,000 Smart Tag transactions, said Harry Kenyon, public works spokesman. In the past 12 months, there were 1.11 million, a 22.5 percent jump. There are four toll booths lanes in each direction. The far left lane is for Smart Tag only, and the remaining three lanes can either have a toll taker, or be designated Smart Tag only. The article goes on to say that the six new toll booth lanes are planned to be completed by Memorial Day in 2004. While not exactly open lane tolling, there is one 14-foot-wide inner lane each way for Smart Tag customers, where they can pass through at 45 mph without stopping. The Virginia electronic toll collection (ETC) system Smart Tag will join the national ETC consortium E-ZPass, pursuant to a decision by the Governor in August 2003. Toll roads in nine northeast and mid-Atlantic states make the E- ZPass system available to drivers. Joining the E-ZPass Interagency Group allows both Virginia’s citizens and visitors to use the convenience of their Smart Tag or E- ZPass in the Northeast Corridor. The Virginia Department of Transportation (VDOT) already has begun working on the integration with other E-ZPass members, which include organizations from Delaware, Maine, Maryland, Massachusetts, New Hampshire, New Jersey, New York, Pennsylvania and West Virginia. “Our goal is that by fall 2004, the reciprocal system will be fully implemented, which means motorists should be able to start using their tags and passes on more roads within about a year,” said VDOT’s Commissioner Philip Shucet. An added benefit of the new membership is the cost savings from the leveraged buying power on long-term technology costs that Virginia will realize as one of the 20-plus members of the group. The estimated cost of integrating E-ZPass with Virginia’s Smart Tag technology is between $3.5 million and $4.5 million. Fees for joining total $250,000, with annual fees of $70,000. The fees will cover all of the automatic toll facilities in Virginia. Chesapeake Expressway Photos - March 2001 - five photos of construction of the highway. Chesapeake Expressway Photos - May 2001 - nine photos of the completed highway. 1) Citizen Information Meeting Brochure, Battlefield Boulevard South (Route 168), from Great Bridge Bypass to North Carolina State Line. Meeting was held February 2, 1989, Great Bridge High School, Chesapeake, Virginia; by Virginia Department of Transportation (VDOT). 2) "Route 168 bypass is Chesapeake's missing link", The Virginian-Pilot, Jan. 19, 1999. 3) "Work begins on long-sought Chesapeake Expressway", The Virginian Pilot - July 13, 1999. 4) The Virginian Pilot VA-168 Chesapeake Expressway website: "Pilot Online / News / Special - Route 168 Bypass" (no longer active). 5) The City of Chesapeake's VA-168 Chesapeake Expressway website - "Chesapeake Expressway Route 168 South" (no longer active). 6) "168 bypass nears finish line in Chesapeake" The Virginian-Pilot, April 15, 2001. 7) "Chesapeake's expressway to Outer Banks opens May 23", The Virginian-Pilot, April 28, 2001. 8) "Chesapeake Expressway set to open - Road to cut travel time to Outer Banks", Richmond Times- Dispatch, May 20, 2001. 9) "Toll road to N.C. ready for traffic", The Virginian-Pilot, May 22, 2001. 10) "Alternate route to Outer Banks set to open Wednesday", Daily Press, Tuesday, May 22, 2001. 11) "Cars begin rolling along last link of Rte. 168 Bypass", The Virginian-Pilot, May 24, 2001. 12) "Trip faster, easier - Expressway saves time, trouble for Outer Banks beachgoers", Richmond Times-Dispatch, May 28, 2001. 13) "Chesapeake Expressway to get more tollbooths", The Virginian-Pilot, November 30, 2001. 14) "Chesapeake Expressway a success in first year", The Virginian- Pilot, May 24, 2002. 15) "Expressway offers way to avoid traffic", The Virginian-Pilot, May 24, 2003. 16) "Virginia to Add E-Zpass to Drivers' Options", Virginia Department of Transportation news release on August 26, 2003. 17) VA-168 Chesapeake Expressway official website. 18) Outer Banks Visitors Bureau - www.outerbanks.org.